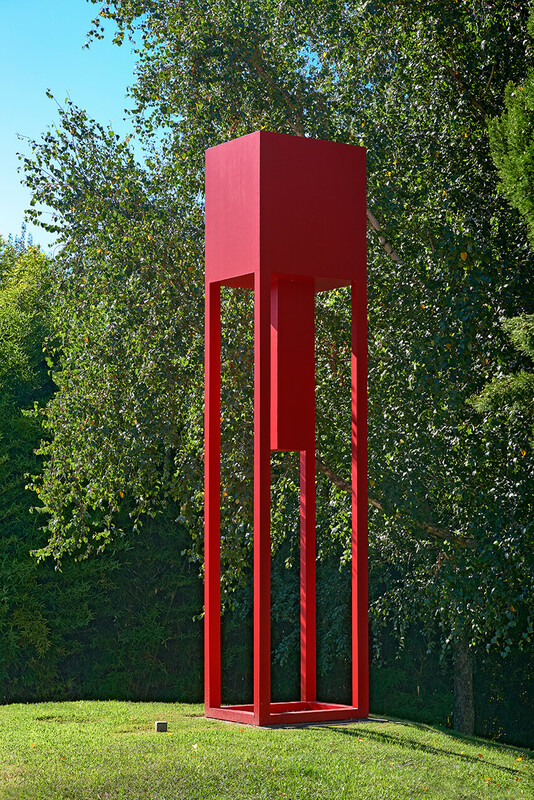 Sheer geometry painted red, and the rule of geometric reason comes face to face with nature’s rule of chance, initiating a passionate dialogue between vegetal organic beauty and the sculpture’s monochromatic surface and formal perfection. Demanding a vertical reading, this piece is based, as suggested by the title, on the Hangul alphabet, used in Korea since the 15th century. This alphabet is made up of ten vowels and fourteen consonants, some of which are graphic representations of the speech organs (position of the tongue, teeth and lips) necessary for their production. On the other hand, vowel designs are based on neo-Confucianist shapes: man, a vertical line; earth, a horizontal line; the sky, a dot. Hang Chang-Jo delves into the universe of Korean writing by expounding the alphabet’s symbolic power through a rigorous construction of radical three-dimensionality, combined with simple lines, pure geometrical shapes, and void as a compelling and decisive force in the composition’s balance.